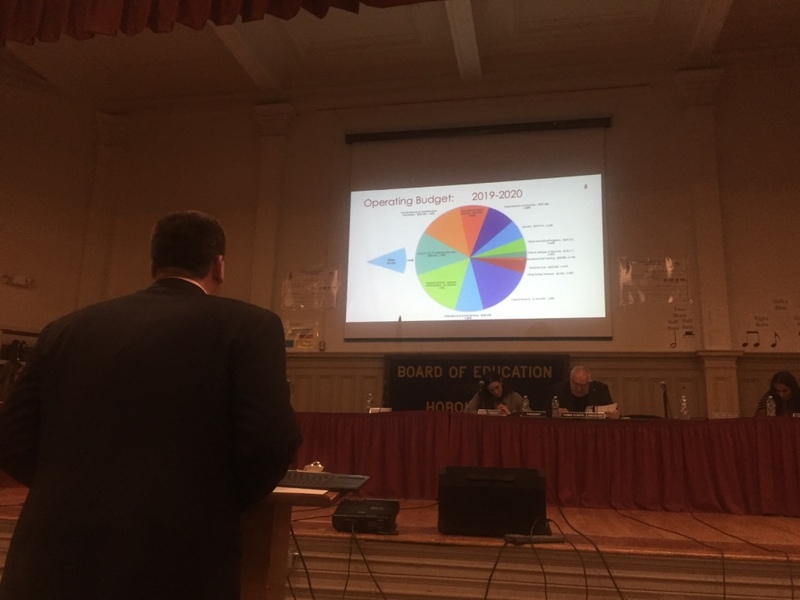 The Hoboken Board of Education introduced a preliminary district budget of about $78.7 million last week. Business Administrator Matthew Bouldin said state aid will continue to decrease over the next five years. 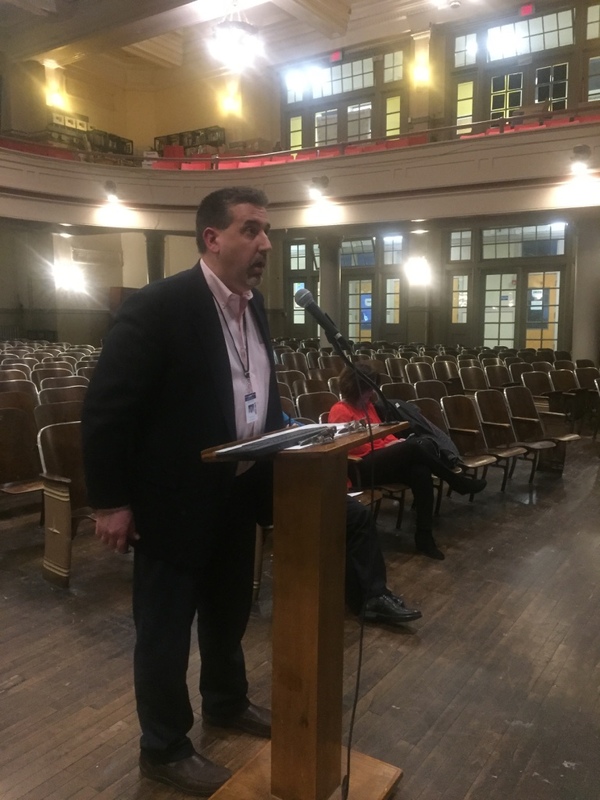 The Hoboken Board of Education held a special meeting on March 19 to introduce a proposed $78.7 million preliminary budget for the 2019-2020 school year, an increase of roughly $5 million from last year’s final budget. The district suffered the loss of just under $450,000 in state aid, announced by the New Jersey Department of Education a few weeks ago. The reduction is because Gov. Phil Murphy signed Senate President Steve Sweeney’s school funding reform bill into law last year, a measure designed to help move all school districts toward equal funding. The budget will be financed from several sources, including a local property tax levy of about 5.4 percent this year or $48.3 million, up from $45.8 million last year. The budget affects residents’ school portion of their overall tax bill. Their bill is made up of tax rates from the schools, city (which has not yet introduced its budget) and the county, whose budget will be struck in June. In addition to local school taxes, the rest of the budget will come from state and federal aid, tuition fees for out-of-town students attending Hoboken public schools, rents, and funds for preschool education. Before 2012, the public could vote on the school budget each April. However, as long as any annual increase to the local tax levy stays within a state-mandated cap of 2 percent plus adjustments, a public vote is not held. The budget will not need to come up for a vote because this year’s preliminary budget is not expected to go beyond the 2 percent cap. Business Administrator Matthew Bouldin presented the budget during the meeting. Of the total $78.7 million, $10.4 million will fund the three charter schools. Those schools, which are also public, raise some funding themselves (not considered part of this budget). The largest portion of the district’s $61 million operating budget is about $14.7 million, which will pay for regular programs and instruction. The second largest portion goes to the charter schools, and the third largest portion is for employee benefits at $10.2 million. Roughly 11 percent of the operating budget is $6.5 million, which includes capital projects, security, individualized education programs such as speech and physical therapy and specialized counseling, and social services. According to the presentation, of the total $78.7 million roughly $15 million, received from state and local sources, goes to fund the district’s free preschool education program, which this year will include seven additional classes to bring the total Pre-K classes to 66 next year. Bouldin said that the introductory budget is a “maintenance budget,” meaning that it allows the district to keep its current initiatives, such as Project Lead The Way, Personal Growth Periods at the high school, and the Passport to Learning after-school program. It also allows the district to pay for their instructional technology needs. Bouldin said that some of the key budget costs are the payments to the charter schools, which have increased for two years in a row (a total of 14.2 percent) as well as special education tuitions and transportation costs, which have increased by roughly $927,549 and employee benefits, which are forecast to increase by $452,500. According to the district’s budget, Hoboken would receive about $9.8 million in state aid. According to Bouldin, the district will continue to receive less state aid over the next five years, meaning more of the budget will be funded through the tax levy year after year. He said the local tax levy is the largest source of revenue of the district’s operational budget, just under 80 percent of all revenue. The tentative budget will be submitted to the New Jersey Department of Education’s Hudson County Office for review and approval. The Hudson County Office may then request or require changes before they approve it. Once it is approved the district will advertise the budget and hold a budget hearing in which more details are presented and the public may ask questions. The regularly scheduled annual public budget hearing will take place on May 7 at 7 p.m. at the AJ Demarest Building, which is located at 158 Fourth St.
After the hearing, the Board of Education is scheduled to approve a final budget on May 14 at 7 p.m. That meeting is also scheduled to be held at the AJ Demarest Building. Residents with questions about the school budget can email their questions to budgetquestions@hoboken.k12.nj.us.